Treat your special ones by ordering online this Amazing Make a Wish Breakfast Gift Basket for them and show how special a place they hold in your heart. Give this mouthwatering Gift to your recipient which holds 4 Packets Knorr Soup 60 gm. 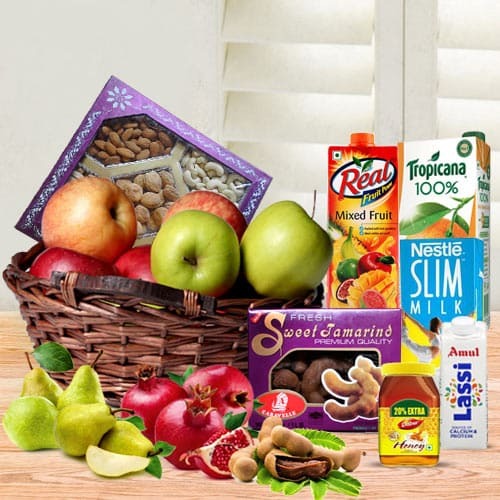 each, Amul Lassi 250 gm., Dry Fruit 1 kg., Dabur Honey 250 gm., Green Apple 1/2 kg., Sweet Tamarind, Pears 1/2 kg., Red Apple 1/2 kg., Nestle Slim Milk 1 ltr., Pomegranate 1 kg., Real Mixed Fruit Juice 1 ltr. and Tropicana Orange Juice 1 ltr.